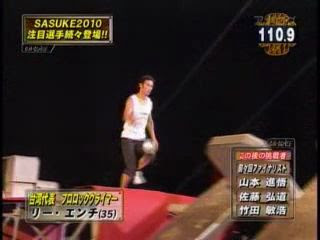 Here he is in Sasuke 22 - in fact out of 5 tries.. he's passed the first stage 4 times! 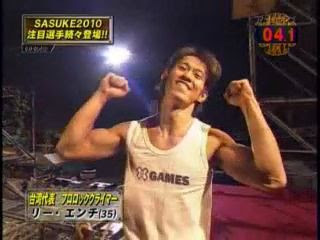 Thanks TBS for helping him get to Sasuke 24! Poor guy spent a month wondering if he was going to be invited since we now know that JET TV has not renewed their Sasuke License. TBS came in at the last second and was able to get Lee to Sasuke literally 1 day before the event! Coming up next (oh. 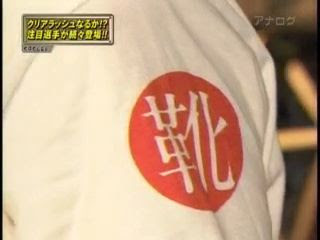 it is bad when I start recognizing names in kanji?? 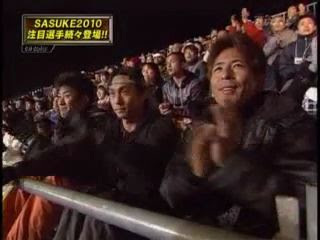 I see Yamamoto and Takeda.. Yeah.. I'm not turning into a fangirl or anything.. wait.. turning? oh nvm)..
NO! He's slipping on the Spider walk..
Whoot! On the first shot! Ending in sight and he's getting a little stuck! GO! GO!! Gingerly walks across the plank and just taps the red button softly! Taiwan's Lee En Chi リー・エンチ - STAGE ONE CLEAR! That's now 92 down and 7 clears! 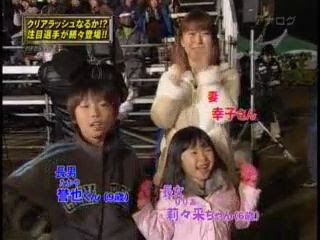 LOL you get a golf clap from the All-Stars and Shingo does one!! Yuuji: Dude.. hit me up man..
Taiwan's Lee En Chi リー・エンチ - back to the 2nd stage for the 5th time! Al Bundy!! :D Ehem.. he sells shoes.. actually .. 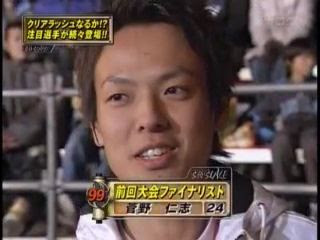 I'm told he got a promotion of some sort and he seems to be moving up in the company (ala Shingo did in his) . Congratulations! 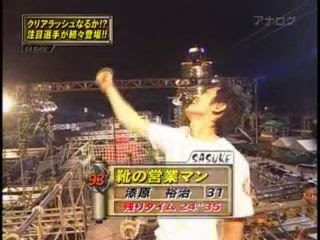 Sasuke 22 he was just a few feet from total victory!! 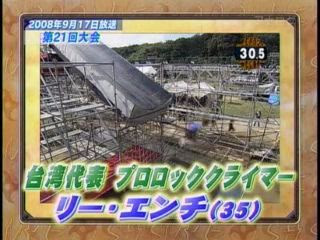 Sasuke 23 he had a horrifying end in Stage 2 on the new obstacle the Unstable Bridge! 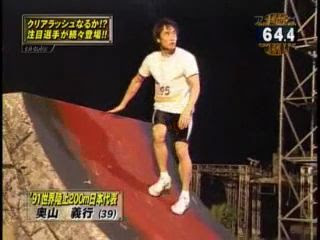 Yuuji Urushihara 漆原裕治 getting focused for his run. 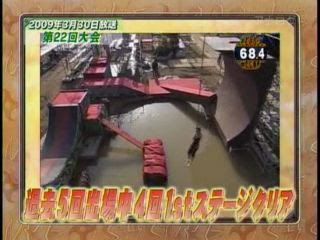 The last time he barely made it past the first stage. Kanji lesson anyone? oh wait.. I know this.. he's said what this is before.. duh..
And up and over on the first try! WOW! LOOK AT THE TIME! Yuuji Urushihara 漆原裕治 - STAGE ONE CLEAR! 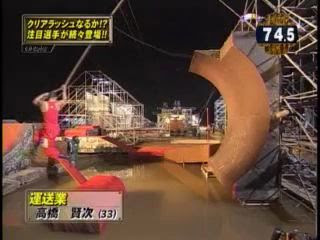 Geez he destroyed the first stage! 93 down and 8 clears! 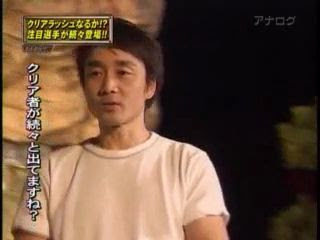 Hitoshi Kanno 菅野仁志 totally representin'! 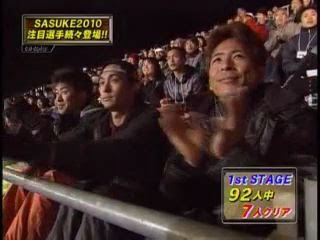 LOL he's so sedate.. "I knew he would make it.."
(to Takeda who's next to him) DUDE did you see the timer??? 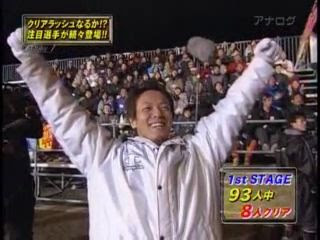 Yuuji celebrating with the top time thus far! Hmm.. I can't make out the back of this shirt.. is it an UNCLI shirt? Yuuji bows in appreciation.. a deeeeep bow..
We've got red pants snowy.... he's not going to be cut or fast forwarded!! Yep! It's KONGO EXPRESS TIME! Ha they have new footage! I swear they read my blog.. didn't I complain that they have been using old footage of him? LOL Yay!!!! Heartbreaking loss RIGHT at the platform at the end of Stage 3 in Sasuke 23.. Ooooh man that was painful to watch..
Training harder than ever to make it this time! Uses heavy boxes to train! HE has that sideways clear thing on the wall as well! YEeeeeehaw he recovered just in time..
First shot up the wall as well! Oooh.. camera angle change... He's also at a fast pace! Wow he's right behind Yuuji in time! He's fast today!! Kenji Takahashi 高橋賢次 - STAGE ONE CLEAR!!! Kongo let's out a rebel yell! 94 have passed and 9 clears!! Will we break double digits today? 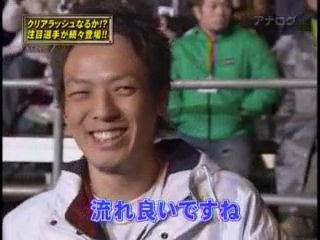 Yoshiyuki Okuyama 奥山義行 Former World Sprinter is up next! Shingo's just tossing his head to the side..
LOL these guys are brutal... I swear we interrupted another one of those conversations that we shouldn't have.. 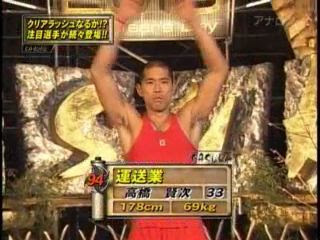 I swear Takeda just swallowed a bird..
New footage of him training too! 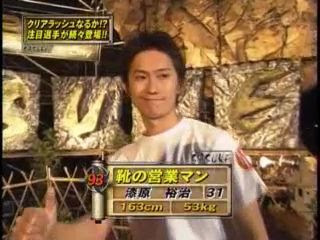 Coming up next.. okay okay I'll cheat.. Yamamoto er.. wait.. I think Sato? yeah Sato, then Takeda then .. Kanno then Nagano. Very slowly walks across and also gently hits and holds the red button! Yoshiyuki Okuyama 奥山義行 - STAGE ONE CLEAR! In complete contrast to Kenji.. 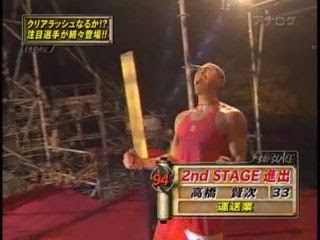 I mean you can't get anymore 180 degree difference in demeanor here.. Okuyama quietly celebrates his win. 95 down and 10 clears! YES double digits! Meanwhile.. oh oh.. omg this is funny..
.. they are bending over in laughter.. omg this is bad.. really bad..
Takeda leans over to make sure Shingo's ready..
Nagano can't stop cheesing.. now the other guys are smiling..
Geez this is taking long..
Takeda: Sorry sorry my bad.. 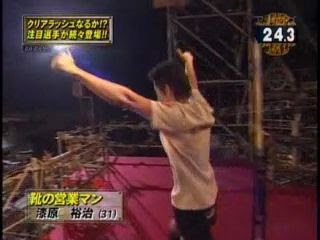 I got it I got it..
Takeda: Okay this time for realz man..
Shingo: Alright already just go! Sure you want me to? Winding up from all the way in Toledo.. Slap is crossing time zones now..
Wtf.. Nagano wants to get in on the action!! He slaps him too! 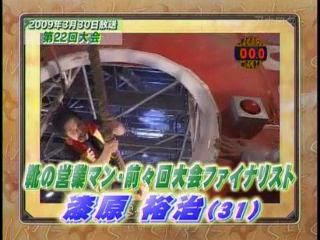 LOL I hear Shingo Scream..
Much laughter is ensuing now..
Shingo: wtf that hurt! You guys are crazy! No way in hell is this relaxing!!! Dude quit complaining.. he didn't get up on the platform like he did with Akiyama, AND he triple folded the towel.. AND he had gloves on.. quit whining you pansy..
Shingo: No way man.. I'm in pain now.. I can't concentrate! Dudes, seriously.. you all need therapy..
Yuuji and Kongu's runs were simply terrific. 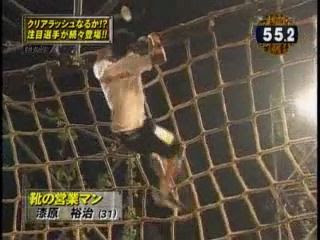 Yuuji rushed a lot...he even destroyed the thingie olding up the rope before the Rope Wall, if I remember correctly. He did break it! I totally forgot about that. LOL (Yuuji I mean) That's why when he got to the wall he was completely turned backwards. 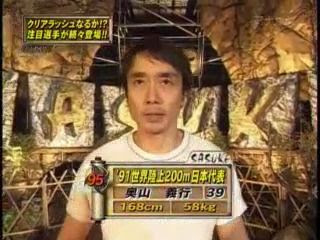 After Urushihara's performance, his shoes sales can only ROCKET UP! we will soon be seing Urushihara Yuuji, "Shoe Store Area Manager" maybe? LOL! OMG yes Lee has a way of nail biting just about every finish! I'm sure he's even just as skiddish about it!